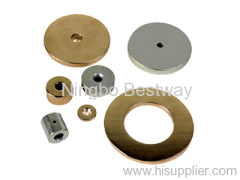 Alnico alloys(AliNiCo magnets) are ferromagnetic, with a high coercivity (resistance to loss of magnetism) and are used to make permanent magnets. 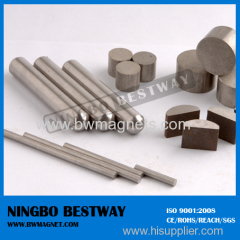 Before the development of rare earth magnets in the 1970s, they were the strongest type of magnet. Other trade names for alloys in this family are: Alni, Alcomax, Hycomax, Columax, and Ticonal. 1.composed of primarily aluminum, nickel, and cobalt, were developed in the 1940's. Alnico magnetsl are manufactured through either a casting or sintering process. 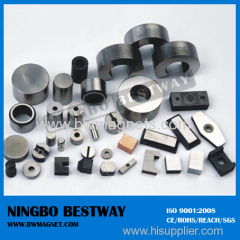 Alnico magnet is very hard and brittle. 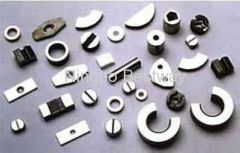 Alnico materials (composed predominantly of aluminum, nickel, and cobalt with minor amounts of other elements.